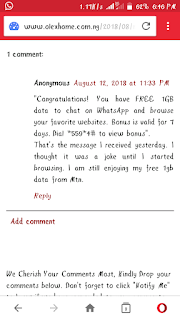 Have you heard about the free MTN 1GB data offer? 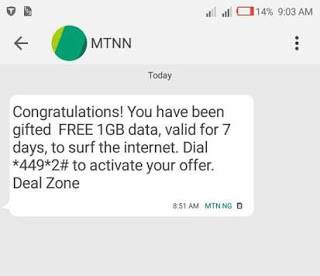 Okay, In this post I'll be showing you one of the MTN free data 2018 and how to get your own from MTN. This data can be used to browse on any device, and also it has no limitation i.e you can use it to browse on any browser or application be it chrome, facebook, whatsapp, instagram, etc. But you should note that this offer is only for some selected sims just like the mtn free 100mb free data which i posted about 2days ago. But the question now is how do you know If you are qualified for this Mtn 1GB free data or not? "Congratulations! You have FREE 1GB data to chat on WhatsApp and browse your favorite websites. Bonus is valid for 7 days. Dial *559*4# to view bonus". 2. If you do not receive message from MTN, you can do it manually by Dialing *559*4# on your mtn line and you'll be able to confirm whether you were given the Free 1GB data or not. Remember I said earlier that this offer is only for some selected sims, so in case you don't receive the free data, you can try it on any other MTN Sim. 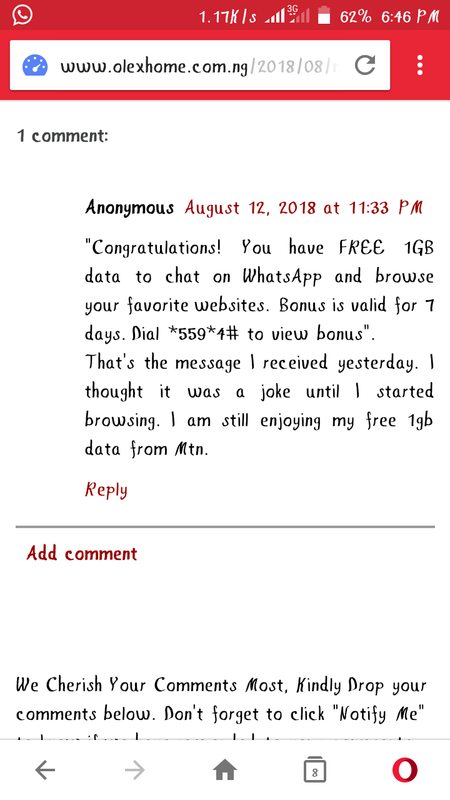 A lot of people have been enjoying this mtn free data promo as you can see in the screenshot above from a comment made by one of the visitors of this blog, so try it out and let us know if it worked for you as well. Enjoy! Yes I'm also a beneficiary...All thanks to mtn.